John Wilson's practice is concentrated in the areas of business law, estate planning, real estate and employee benefits. Since 1988, he has advised clients regarding business succession planning, contracts, contract litigation, corporate compliance, risk management, business transactions, probate and trust administration, and real estate law. He has represented clients in all areas of business and corporate law, including formation, structure, governance, management, and the acquisition, merger and sale of closely-held businesses. Mr. Wilson has conducted a vibrant real estate practice in both the commercial and residential areas, including transactions, leasing, financing and property management. He has been particularly active in working with clients requiring estate planning and arrangements for devolving wealth to future generations. A substantial portion of his practice involves advising clients on employee health and welfare benefits plan compliance. 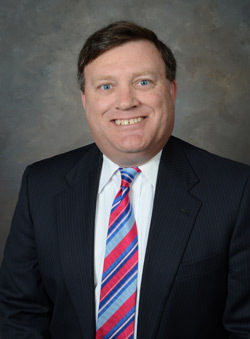 Mr. Wilson also serves as general counsel for a diversified holding company that owns businesses in the technology, employee benefits, and real estate segments. John has been actively involved over the years in a variety of community, civic, church-related and charitable organizations, including Past President and current board member of the Bloomfield Hills Rotary Club, Past Assistant District Governor for Rotary District 6380, past Chairperson of the stewardship commission at St. Hugo of the Hills Catholic parish, and a current board member of Casa Vitae, a non-profit. Mr. Wilson has been an active youth athletics coach, principally coaching in ice hockey and boy’s lacrosse. He currently assists the Birmingham Unified Boys Lacrosse team as its off-season coach. Mr. Wilson is also an active member of Orchard Lake Country Club. Mr. Wilson lives in Bloomfield Hills, Michigan.